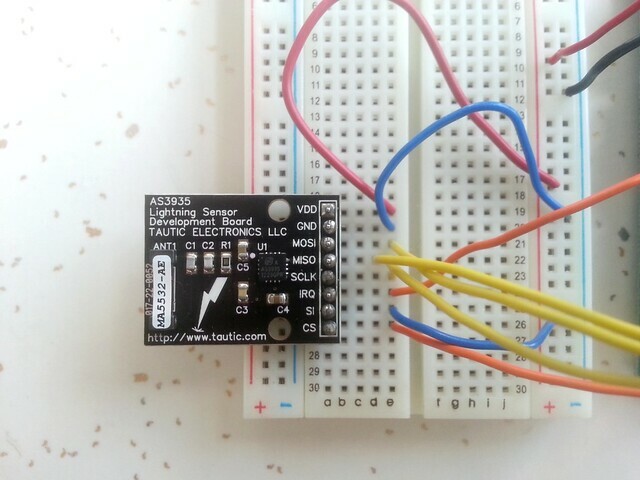 Browsing Tindie I stumbled into the awesomeness that is this lightning sensor breakout board by Tautic Electronics, which is build around the AS3935 Lightning Sensor IC by austria microsystems. Which fit in perfectly with my recent interest in electromagnetics, and the always present wish to touch more bare electronics. The board is sensitive RF receiver – coupled with a proprietary algorithm – able to detect the specific radio frequency emissions generated by lightning activity. The algorithms on the chip distinguish real lightning strikes from from man-made electromagnetic “disturbers” and can calculate the energy and distance of strikes over a 1–40km range. I’ve documented all my experiences with the sensor so far (how to calibrate, antenna tuning, what man-made disturbers are detected, etc.) on my github repository ThunderAndLightning. Sadly, there haven’t been many thunderstorms yet, which made it hard to test and calibrate the sensor. So far, this has turned more into a study of man-made disturbers than natural lightning strikes. Which obviously is equally interesting, though I am definitely looking forward to a stormier spring season. Posted in Blog and tagged AS3935, electronics, lightning.